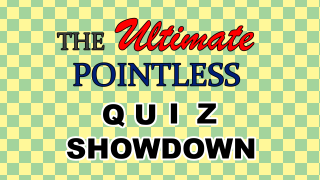 Ultimate Pointless Quiz Showdown is a game made by VinnyVideo for the 2018 April Fool's Prank. This game includes six different trivia games, with a total of 93 questions. It's one of the first games on MFGG to use the latest version of Game Maker, Game Maker Studio 2. The game saves your highest score for each of the six quizzes and includes an optional online high scores system, which sums up each player's score across the six quizzes. Vinny has stated that whoever submits the highest score (as of the morning of May 1, 2018) will receive some kind of prize. Hypernova won, winning a decent amount of coins. Runner-up prizes were also given. The "quiz show" level has become a famous - or infamous, depending on whom you ask - part of Vinny's games, appearing in several of his previous games. These trivia games tend to focus on obscure topics, and for that reason have attracted some negative feedback. For the 2018 April Fool's prank, Vinny decided to make an entire game consisting of trivia games about obscure topics. While most of the questions - in this game and in Vinny's other games - are difficult, the correct answers can usually be found through a Google search. This page was last edited on 22 October 2018, at 00:40.